I grew up playing in the mountains of New Hampshire where my mother, a former Outward Bound instructor, took me on my first backpacking trip at age 10. I vividly remember hiking 10 million miles to our camp with a 150 pound pack (a three mile hike with a 20 pound pack…it’s all relative to a 10 year old), having my mind blown by the idea of cooking mac and cheese without a proper kitchen, and nearly falling face-first into a big pile of rocks on the way down. 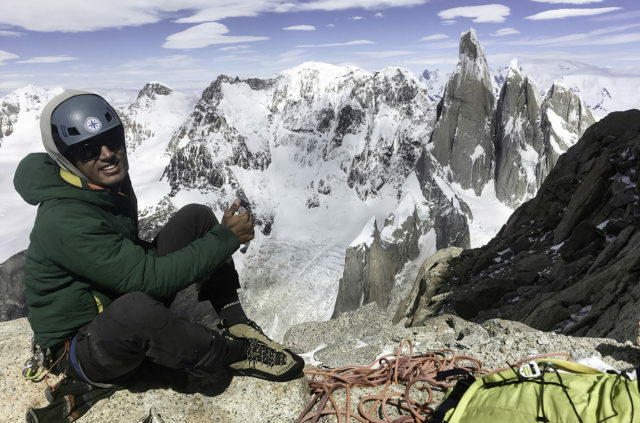 Matt Zia on Aguja Poincenot, with Cerro Torre in the background, Patagonia. Since that formative experience, I’ve based most of my life decisions on accessibility to the outdoors. For college I traded the icy, cloudy, small, beautiful, and deceptively rugged mountains of New Hampshire for the powdery and sunny mountains of Colorado. As a student at Colorado College, I was fortunate enough to find a group of mentors who taught me how to place trad gear, read avalanche terrain, and most importantly, continue the tradition of sharing that love with others. I now live in Bozeman, MT and split my time between teaching high school math, working as a program manager for the Montana Wilderness School, teaching avalanche courses, and sneaking off to go climb and ski whenever possible. I’ve had the incredible fortune to be able to climb all over the world, from the forgotten corners of the Utah desert, to the otherworldly limestone tufas of Kalymnos, Greece, and the magical granite spires of Patagonia. But at the end of the day, I’m happiest when I get to share a day in the mountains with dear friends and when my truck and I get to have a sleep-over somewhere down a long dirt road without cell phone service.